This Article was originally published at overgrow.com 27/6/2000. Revised and archived 20/10/03 by Oldtimer1. As you can see there is little residual fertiliser left in the compost. It is what we call spent (worn out). The first thing we do is trim back nearly all the top growth back to the main framework branches. Leaving one or two tiny shoots at the tip of each branch to draw sap and keep the branch alive. 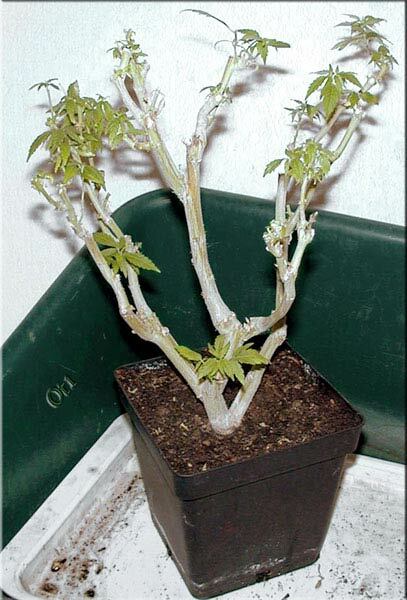 If all the shoots and buds are removed, 99 times out of a 100 die back sets in– and once that starts the whole plant usually dies within a month or two. It doesn't matter if the small shoots are yellow from lacking N, they will soon start to grow and green up as the new roots start forming! This image has been resized. Click this bar to view the full image. The original image is sized 516×640. 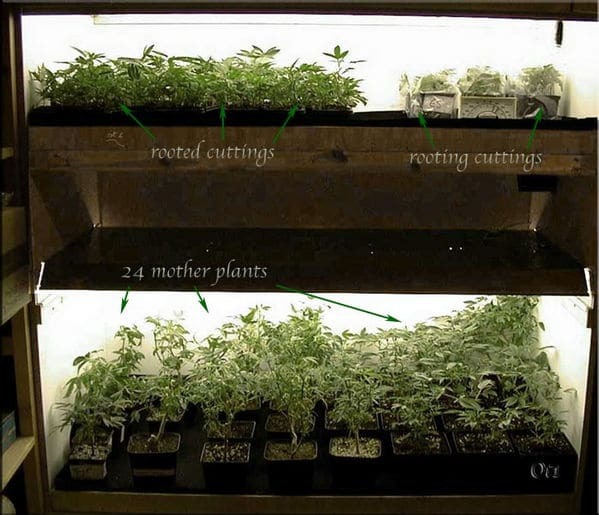 "A lot of interest has been shown in the methods we use to keep mother plants, how we make them, manage them and how we do our cuttings production." – Oldtimer1 1999. This issue we will we will cover our soft tip cuttings system in detail and a brief outline about our mother plants! Every grower can get the same results by imitating our easy organic system. As an outline our mother plants are kept root restricted, i.e. using some standard bonsai methodology and techniques. 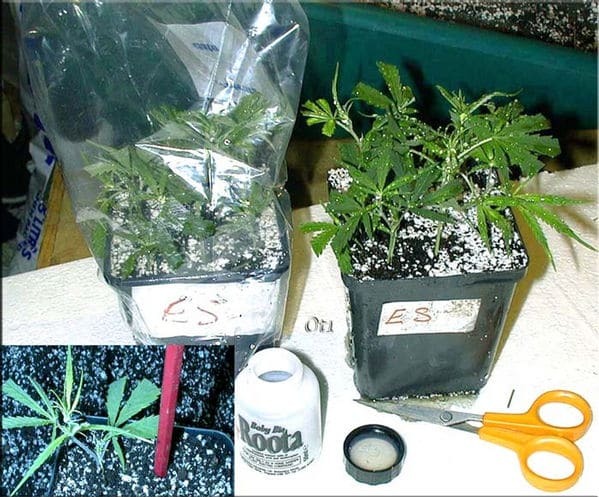 It is an excellent method for keeping mother plants long term and has proved a very reliable system since we developed this method some 24 years ago. The longest a mother has lived like this without having to be replaced is just over 15 years. 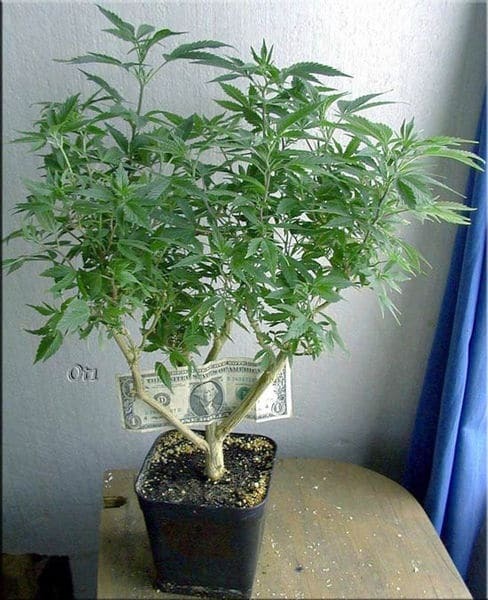 On average pure indicas need replacing every 3 years, hybrids every 4 to 5 years and pure sativas every 6 to 7 years! Of course it depends on the care they are given! 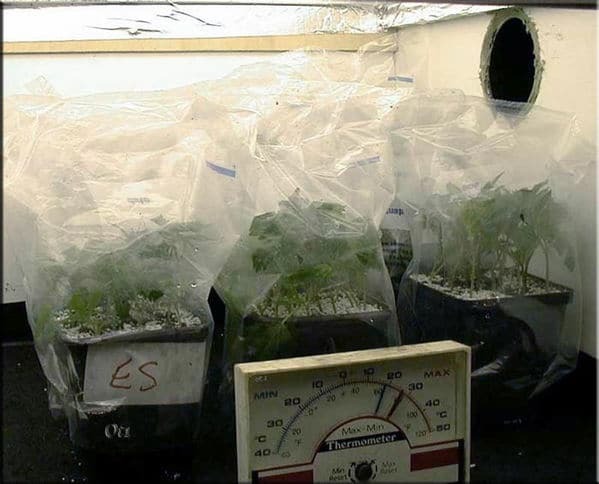 Male plants can be kept in the same way and in fact will stand more abuse than mother plants. Clone, Mum and Dad box. 100 cuttings at the start of rooting. 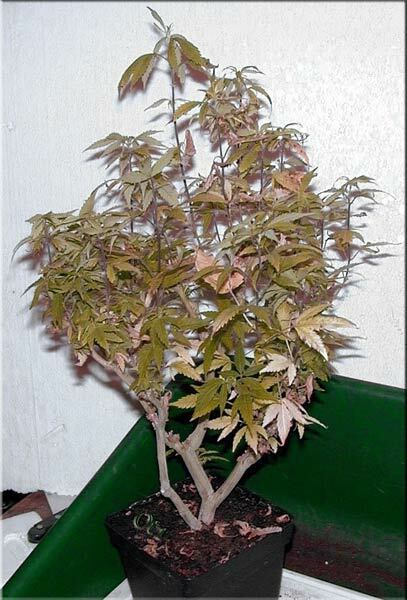 One of the big advantages using bonsai mother plants, is that each only needs a maximum of 8 x 8 inches. So a 2 ft x 2 ft x 2 ft high box with a 4 tube fluorescent shoplight can hold 9 mothers. We call the plants we keep Mums and Dads! Not to be confused with chrysanthemums (that bit is for you Cha Cal). 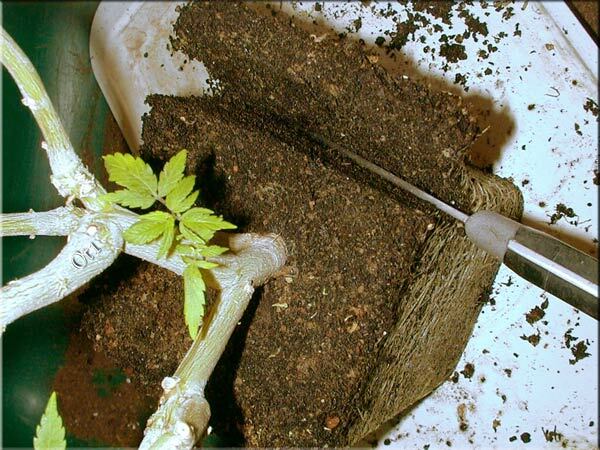 Some of the quotes I have read in High Times saying that you get genetic degeneration by keeping mother plants long term, this is total rubbish! 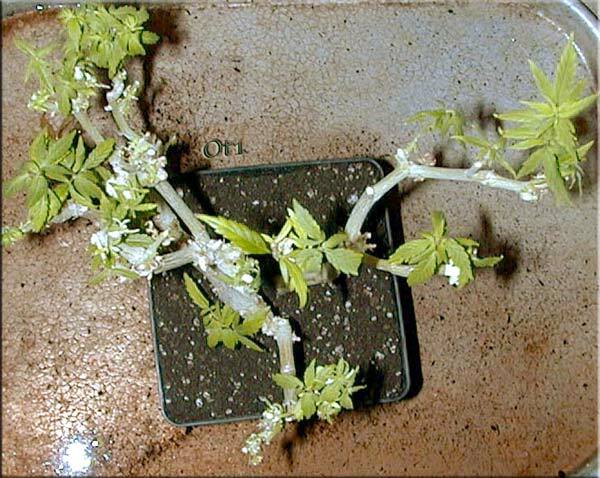 Degeneration can certainly occur if a mother plant gets infected with a reversion virus. I will cover this later! The grass produced today from our mother plants is just as potent and smells just as good as when it was first grown out from seed many years ago. In fact it is better now, we have better lighting and superior growing techniques, allowing the clones to express their potential more fully. I am going to start by showing you our largest mum, this time from above. She is in a 1-litre pot (the largest size used). With all the top growth pictured she is about 13 inches tall and ready to take cuttings. Inset is a cutting being clipped out see below. The type we take are small soft tip cuttings, 2.5 to 3.5 inches long. It is important that there is no lignification at all. When I first discussed this with friends on the net some 3 years ago was with some disbelief, and a lot of amusement at the idea of toothpick sized cuttings. How on earth was I going to get a decent crop of buds? 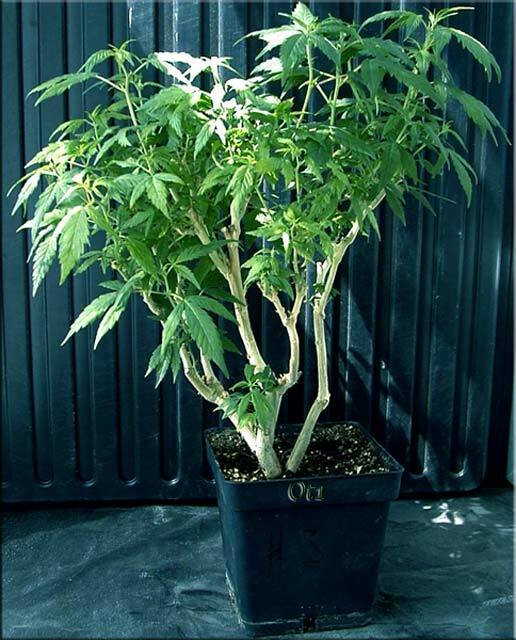 Well, soft tip cuttings have an unrestricted growth potential and grow much faster than semi hard or fully lignified hard wood cuttings. 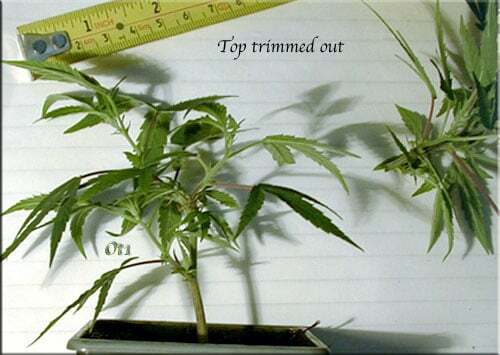 At the end of the day we get a much higher crop weight using the soft tip cuttings. I use fine point scissors for trimming the plants, they are fast and easy to use. 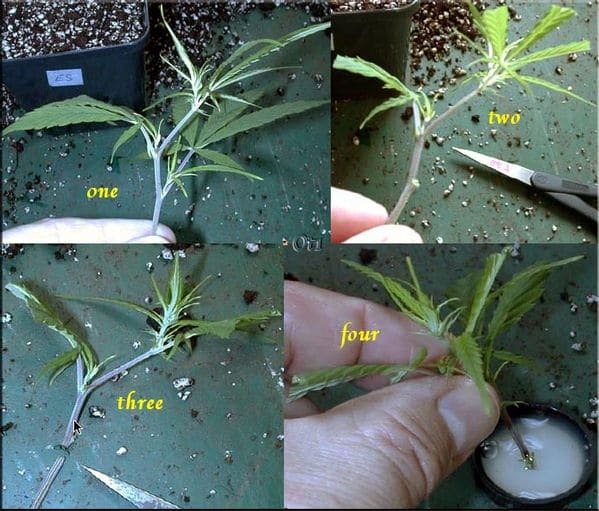 Quick enough to do 2 to 3 cuttings a minute. Forget the stories that they bruise the stem and cause rot, it's rubbish! They do need to be sharp, so buy a new pair and keep them just for this task. As far as hygiene is concerned, providing all you Mums are free of virus, simply put them through the dishwasher after every session to get rid of the sap build up. This keeps them free and easy to use. [one] – typical tip cutting ready to prepare. [two] – snip off the side shoot and leaf the node you want to root. [three] – cut just below the node you want to root. [four] – dip the trimmed node in rooting hormone. -The dibbed cuttings are then watered in using a fine rose same mix as above to settle them in. -Preferably cool-white fluorescent lighting at 20 w per sq foot and a temperature of 75 degrees fahrenheit. "There are a number of reasons for not rooting directly into plug trays." Lets look at what we need from a rooted cutting… We want one that is suited to growing in a confined space i.e. a pot. They are as closely matched as possible. 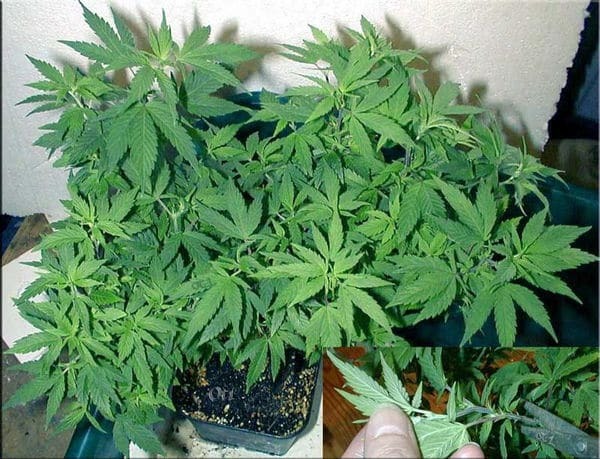 To get good yields from a grow, uniformity is the rule. It is no good having one plant that produces 50 grams when its 2 neighbours only produce 15 grams each. They are identical stock but this is what is often seen in grow after grow. 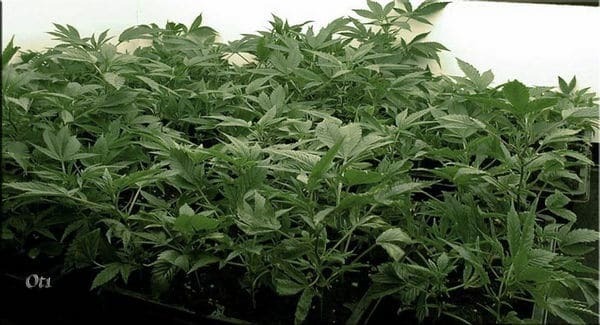 It is much better to try and get all the plants averaging 35 grams well within the capacity of the stock line of a plant that can make 50 grams. 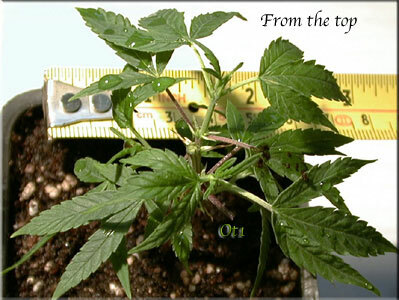 The 3.5-inch pots are 4 inches high; the rooting mix is very open with low nutrient content. This encourages early taproot development. 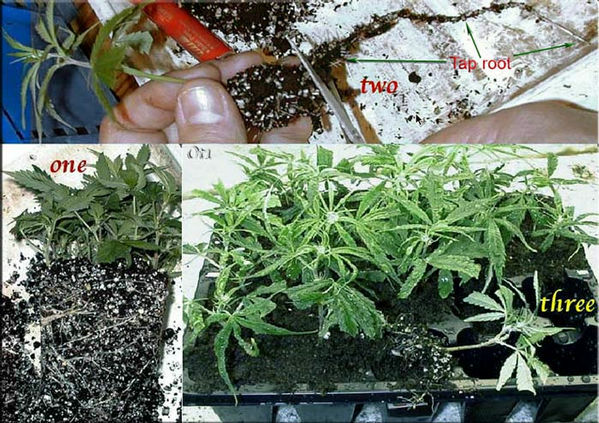 Not all the cuttings will have rooted at the same time, so when they are transferred to the plug trays the root balls are trimmed to the same size and the tap root is removed, this goes a long way towards equalising the clones. Once they are transferred as below they tend to stay pretty even and grow on rapidly. To show what we are looking for some equalised clones grown on and just put into flower. 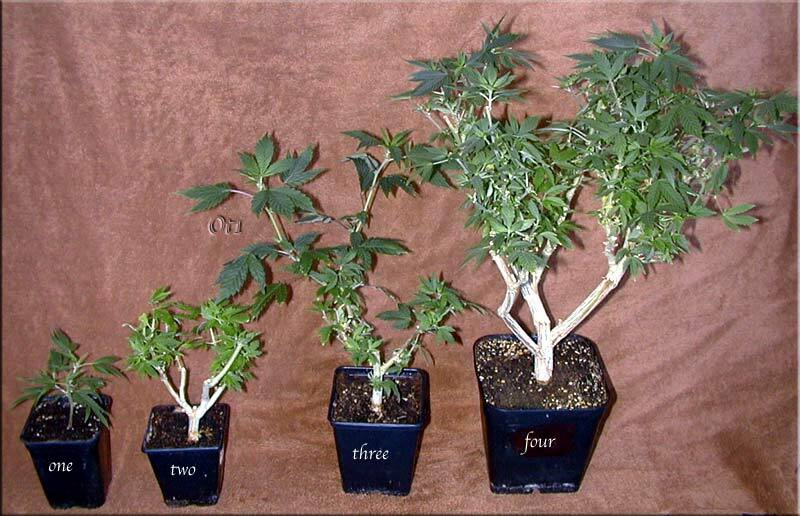 There are several varieties in this grow and there is not more than an inch or so between plants in each variety. They are placed by variety to make a stadium effect and make maximum use of light. Around ten days later the cuttings will have rooted through. The rootball is gently broken up, each cutting has its roots trimmed back to equalise the cuttings and make them fit the plug tray! Full strength peat or coir compost using organic base fertilisers, are used for this. Then they are put back in the Clone/Mother box for about 5/6 more days until thoroughly rooted through, this is very important at all stages of repotting! Fully rooted plants just jump ahead when moved on– we have found that plants moved into bigger pots too early typically produce 25% to 30% less final crop weight! 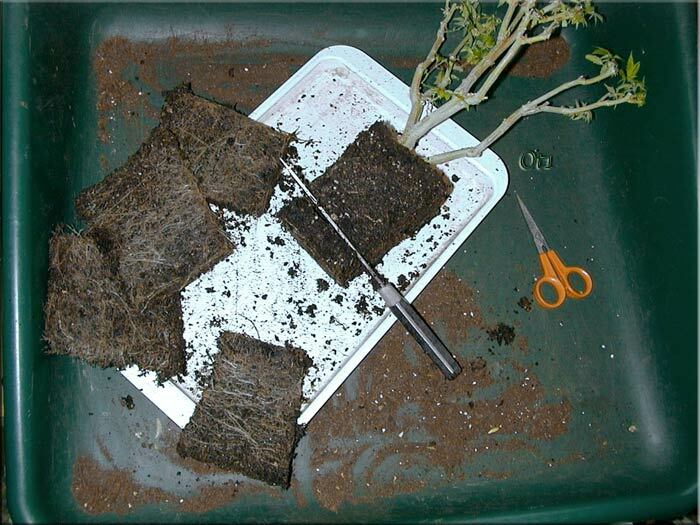 Moving the rooted cuttings to plug trays. Cuttings in plug trays a few days later ready to move on to their first pots. 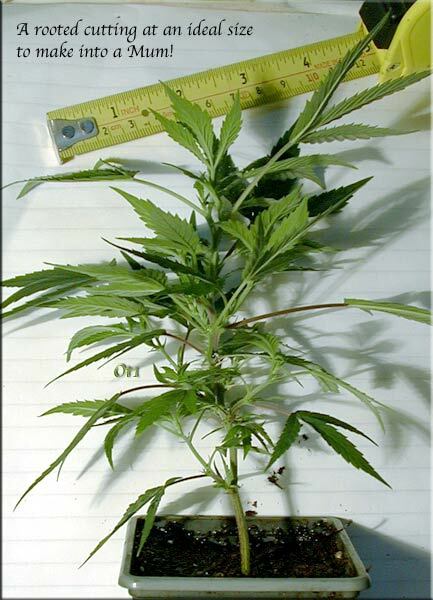 Showing a cutting out of the plug tray, fully rooted out and ready to go. Cutting like this can be taken from any plants in veg. That's it you are ready to grow!